From the picture, that looks like a curved and sloped surface (not a simple angle). Pretty challenging for a first project, but with patience—and some tools—it could be done. Is the “trouble” you’re having is determining the shape, creating the shape, or both? Th is is the kind of thing that begs to be 3d printed. Do you have a 3d model of It? I could potentially help you if it will fit on my printer. Otherwise, to make those shapes I think you would need a router and a circle jig. First cut the circle to the smallest diameter of the slope, then come back through with a bit that could leave that cove. It’s hard to tell from the pics, but it may just be a 45 degree chamfer, which is a common bit. Use a forstner bit for a 90 degree angle. 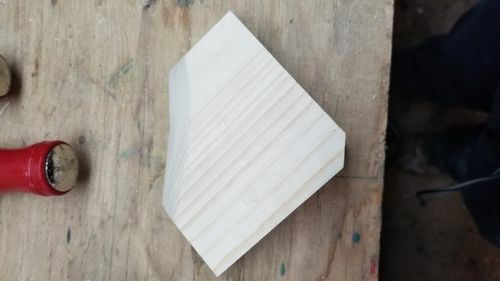 I’d say that as a beginner, get it as close as you can using whatever saws or drill bits as you have and then use a rasp or file to shape the bevel and clean it up with sandpaper. 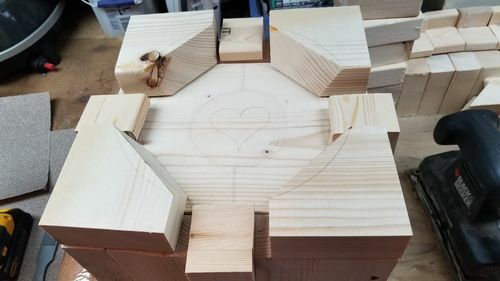 I would do it with a chamfer router bit and make some patterns out of MDF. Perhaps make each side as a square with a hole in it. Chamfer the hole and then cut it into the segments. That’s gonna be tough without special equipment. Like others have said, it might be best to try and carve it out. What are the dimensions of this going to be? If its not too small, you might want to consider building this in pieces. Start with the basic cube, and then glue all of the corners on. That will make it easier to shape that profile. Ok so I went back this morning to take some pictures and try carving by hand. I think I could get a good result with them but I’m pretty interested by the router some of you have mentioned. Do you have any suggestions about which brand I should look for? I don’t want to spend TOO much but I can invest in a good quality tool if its worth it. I don’t think that using a router would be good idea. It could be done but by the time you get the tool, the proper chamfer bit with guide bushing or bearing, and make a template, you’ll probably have as much time into it as doing it manually. If you plan to make a bunch of these, it might make sense but for just one, not so much.